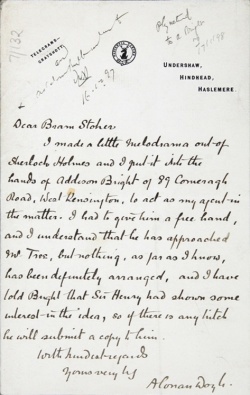 This letter was written by Arthur Conan Doyle to Bram Stoker (author of Dracula). Undated. I made a little melodrama out of Sherlock Holmes and I put it in the hands of Addison Bright of 89 Comeragh Road, West Kensington, to act as my agent in the matter. I had to give him a free hand, and I understand that he has approached Mr Tree, but nothing, as far as I know, has been definitely arranged, and I have told Bright that Sir Henry had shown some interest in the idea, so if there is any hitch he will submit a copy to him. This page was last edited on 13 October 2015, at 07:11.